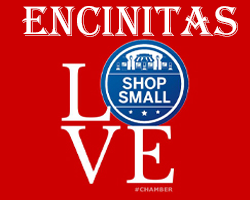 Encinitas is the Perfect Place to Shop Local! Encinitas is the perfect place to shop local. With the wide variety of shopping options and the ease of walking our shopping areas in a mild climate, there are plenty of opportunities to support our local business owners, many of whom are also residents. We’re lucky here at the Encinitas Chamber of Commerce. It’s our job to meet local business owners and to get to know our unique business community. We do this through ribbon cutting events for our members and networking events open to both members and non-members. We also do this through our yearly economic landscape survey where we walk the business areas of all five communities: Cardiff, Leucadia, New Encinitas, Old Encinitas and Olivenhain. The goal is to see which businesses have come to town, and which ones have left. It is a lot of work – and a lot of walking – and we know we could probably use the internet, but we don’t want to. We want to see for ourselves. We often stop in at businesses to learn more and we always come back to the office excited to share the newest retail, professional or dining establishments we find on our travels. Our aim at the Chamber is to advocate and promote a healthy and prosperous business environment, which improves and preserves the quality of life for the whole community. Many studies have stated that small businesses are the engine of the economy, providing local jobs and resources. Keeping purchasing power local helps our businesses get a bigger piece of the shopping market which leads to more business reinvestment in the community. There’s a personal benefit, as well. It feels good to spend money and to know that it helps our friends and neighbors make a living. Shop local and shop often. As someone who has walked almost every single business in this town, I promise you that you can find anything you can think of, and probably quite a few things you hadn’t ever thought of. When you need a shopping break, stop in at one of our coffee shops, cafes or restaurants to recharge and socialize. Make the Choice. Make the Difference. Make it Local.